It’s taken five years, but the head-to-toe renovation of the Fairmont Chicago Millennium Park is now complete. The hotel’s Millennium Park location puts it a block away from the north end of Grant Park, only a couple of blocks from the Lake Michigan waterfront and close to the shopping of Michigan Avenue’s “Magnificent Mile”. The $60 million renovation project makes the Fairmont one of Chicago’s most stylish luxury hotels. 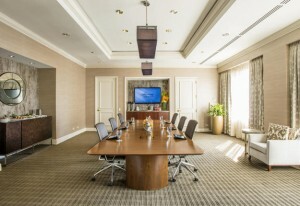 The final piece of the project was the rejuvenation of the hotel’s 63,000 square feet of meeting space. Walls have been re-covered, carpets were replaced, windows have received new treatments and all of the meeting rooms and ballrooms now match the contemporary look of the rest of the hotel. They’ve even added a couple of new meeting spaces: a mid-sized (1,300 square feet) space adjacent to the lobby and an “executive boardroom” on the 37th floor. Accommodations at the Fairmont Chicago range from merely luxurious guest rooms to seriously decadent suites. You can keep yourself in top condition in the fitness center or “mySpa”. On-site dining is offered in the Asian-influenced “aria” restaurant. AlphaNexus.com has all you need to book your stay at Fairmont Chicago Millennium Park, including proximity to nearby Chicago landmarks, buildings and attractions.